This hot weather treat is remarkably simple to prepare and packs a tasty, refreshing lift as a healthy, no sugar added, dairy-free dessert. Turning frozen bananas into a kind of ice-cream has become a bit of a summertime phenomenon, with the NY Times last month sharing its “outrageously easy,” one ingredient banana ice-cream recipe. 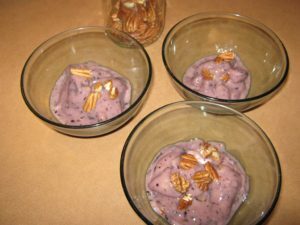 With local, no-spray and/or organic blueberries currently available, I decided to add to the recipe’s simplicity and serve up a two ingredient, banana blueberry “ice-cream” to appreciative dining guests on a sticky summer evening. 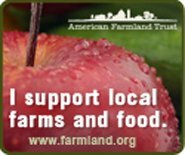 In addition to my weekly CSA share from a local farm, visits to local farmers markets, and of late tomatoes from my backyard garden, the Honest Weight Food Co-op in my hometown of Albany, NY is a reliable source of organic fruits and vegetables. 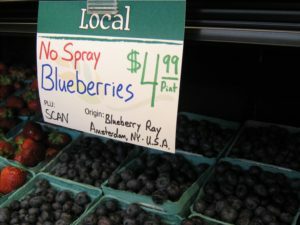 And the appearance of Ray’s of Amsterdam (Montgomery County, NY) no-spray blueberries were a welcome sight in lieu of nationally branded Driscoll organic blueberries (the largest berry distributor in the world), also on sale at the food co-op. Although Ray’s no-spray berries cost $1.00 more per pint container than Driscoll’s, keeping the dollars local outweighed the cheaper cost of organic blueberries that were transported from afar. Plus, of late, there has been a boycott of Driscoll berries as reported by Democracy Now. After enjoying Ray’s no-spray local blueberries in my first preparation of this recipe, later in the month, the co-op was offering hand picked, “certified organic blueberries” from another local source, Grindstone Farm in upstate NY’s Pulaski (Oswego County). Although a pint of these blueberries was $2.00 more than Ray’s no-spray blueberries, purchasing from a local farm, which meets the challenges of “certified organic” standards prompted my decision to use these upstate NY blueberries in my second preparation of the recipe. Further, if the selection was based on “taste”, Grindstone Farm’s blueberries were truly something very special, juicy and sweet with a slightly tangy accent. The plastic container in which Grindstone Farm’s blueberries are sold assures they remain firm and uncrushed; however, Ray’s no-spray blueberries green cardboard pint containers, which can be recycled at the co-op are preferable. In preparing this post, I also discovered another local source for organic blueberries: Blueberry Hill Solar Organic U-Pick Blueberries in Galway (Saratoga County, NY). No need to purchase Driscoll’s organic blueberries! Since fruits and vegetables have “terroir”, a taste-test of blueberries might be in the offing (like a carrot tasting which was surprisingly fun) comparing Ray’s no-spray, Grindstone Farm’s and Blueberry Hill Solar Organic’s blueberries. Bananas of course cannot be grown in upstate New York in the year 2016. The Honest Weight Food Co-op only sells organic bananas at a fair price of 99 cents per pound. Although bananas have never appeared on the Environmental Working Group’s “Dirty Dozen” list of conventionally grown foods to avoid, and their skins are peeled before eating the fruit, consideration must be given to the use of chemical sprays and treatments to grow conventional bananas, which has the potential of putting at risk the health of farmworkers who tend and harvest bananas, and the chemical sprays must have some affect on the environment where the bananas are grown. 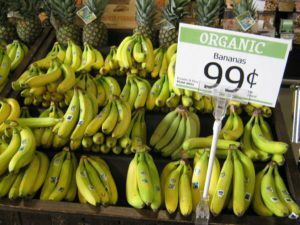 Furthermore, the organic bananas sold by the Honest Weight Food Co-op are fair-traded, often sourced by Equal Exchange, which is promoting Beyond the Seal, a web documentary highlighting the small farmers that are striving to change the way U.S. consumers view and eat bananas. Peel the bananas, cut them in two inch pieces and place them in a freezer bag in the freezer for at least 6 hours. Remove and blend in a blender. My inexpensive blender required me to pulse the bananas and to use a wooden spoon to push the bananas down from time to time. 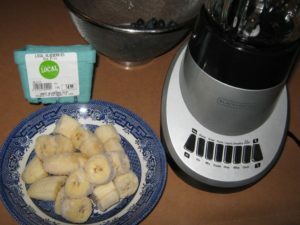 After the bananas are fairly well blended, add the blueberries and continue to blend until smooth. Serve immediately.